There’s hardly any dish that speaks so strongly to my primal instincts the way that a huge pile of deep fried chicken wings, slathered in a thick layer of hot sauce does. That’s the one dish that each and everyone’s inner caveman can agree on – aside from any kind of barbecued meat. Be it Super Bowl Sunday, National Chicken Wing Day, or just any other day of the year, there is absolutely no such thing as the wrong time and/or place to serve up a plate of wings, blue cheese, and celery sticks. But tell me, when was the last time that you actually made them yourself? No excuses anymore. Check out these three simple recipes to become the best possible wingman or wingwoman. Place 3 pounds of wings on a parchment paper-lined baking sheet and roast them at 220°C/425°F for about 45 min. until crisp. In a blender, pulse 1/3 cup mango chutney and 1/3 cup lime juice with 1 chopped red jalapeno, 6 tbsp. melted butter and 2 tsp. curry powder. Toss with the wings and sprinkle with chopped cilantro. In a small bowl, whisk together 1 tbsp. melted butter, 1/3 cup Dijon mustard and ¼ cup honey. Toss with the wings and sprinkle some paprika powder on top. 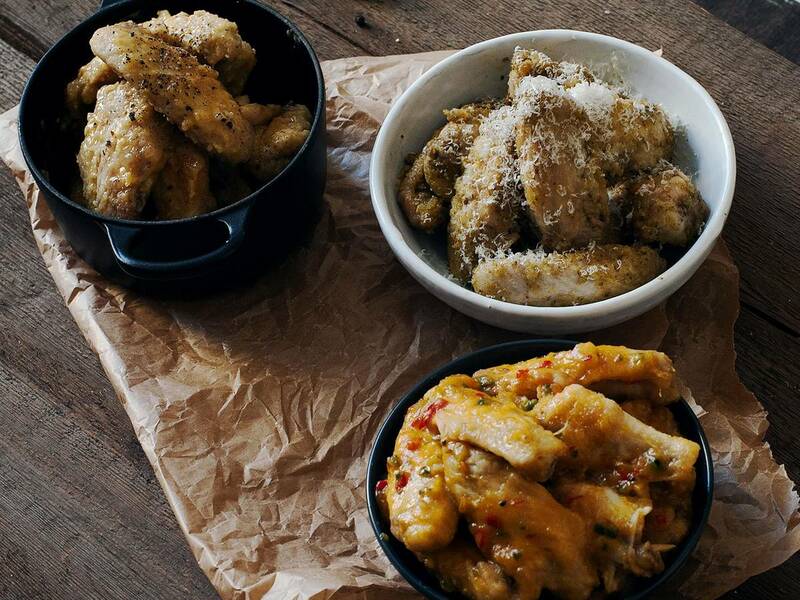 Toss the roasted wings in ½ cup of pesto and ¼ cup of grated Parmesan. These are just three quick suggestions. Don’t be shy and experiment a little to come up with tasty recipes of your own. Enjoy!